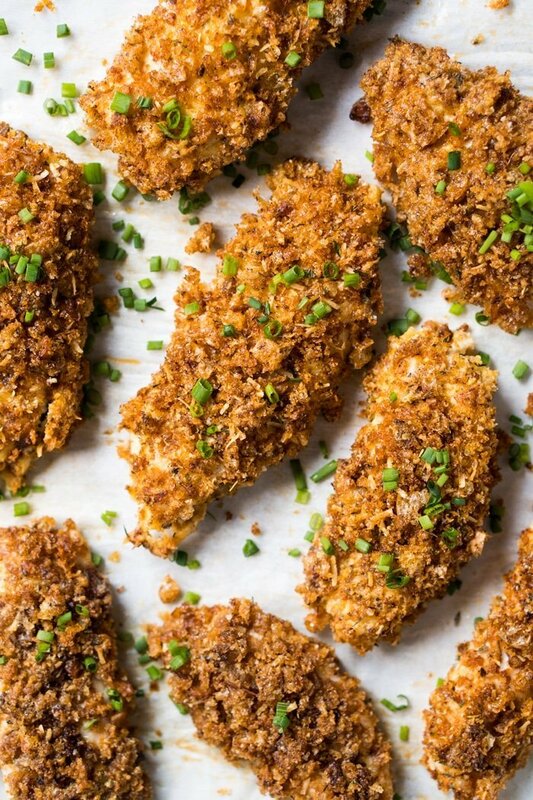 That’s right, these gluten free and keto chicken tenders are, well… extra tender! Plus, they’re baked (i.e. essentially mess-free!). Crispy, tender, and flavorful-to-boot. 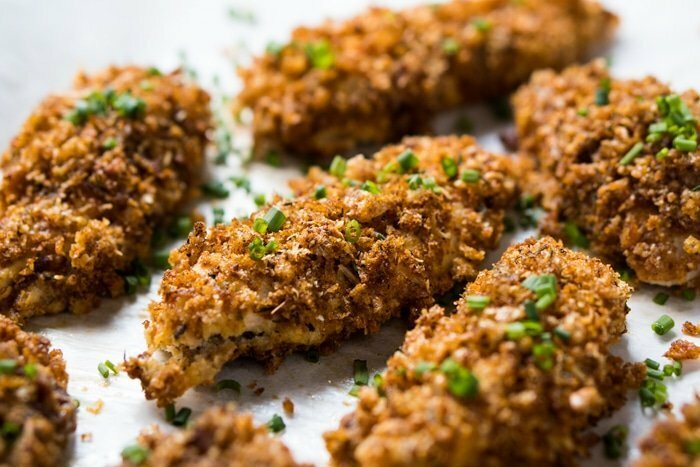 These baked low carb chicken tenders, marinated in sour cream and an awesome spice mix, are a real gold mine. Plus, they’re easy-peasy! The chicken is baked for a mess-free and more hands-off approach. Just try and marinade the chicken overnight– it’s a game changer. For any poultry dish really, always aim for an overnight marinade for best-tasting results (or at least 2-3 hours). 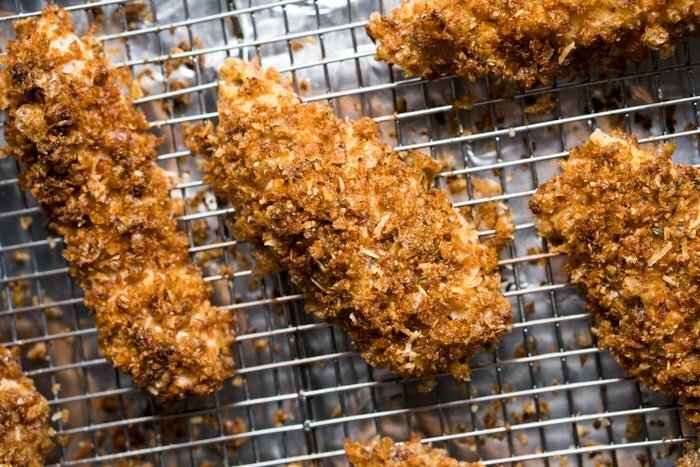 This keto ‘fried’ chicken uses a ‘breading’ rather than a batter. And we love pork rinds (i.e. chicharrones!) more than anything for it. Plus, they’re the perfect balance between fat and protein with zero carbs (i.e. 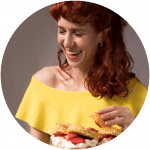 a keto dream come true!). But before you freak out, there is no after taste whatsoever. More like a wonderful crisp texture and amazing flavor. Just know that not all pork rinds were created equal. And, if possible, you’ll want to make a trip to your local Mexican market and procure some proper and fresh chicharron from the butcher. We also prefer to crush it by hand to leave it more flakey than powdery (think panko!). Other than that, you’ll want to marinate the chicken in sour cream (with a touch of vinegar and spices). Then you’ll do three layers (almond flour, egg and pork rind blend) for the ultimate coating. 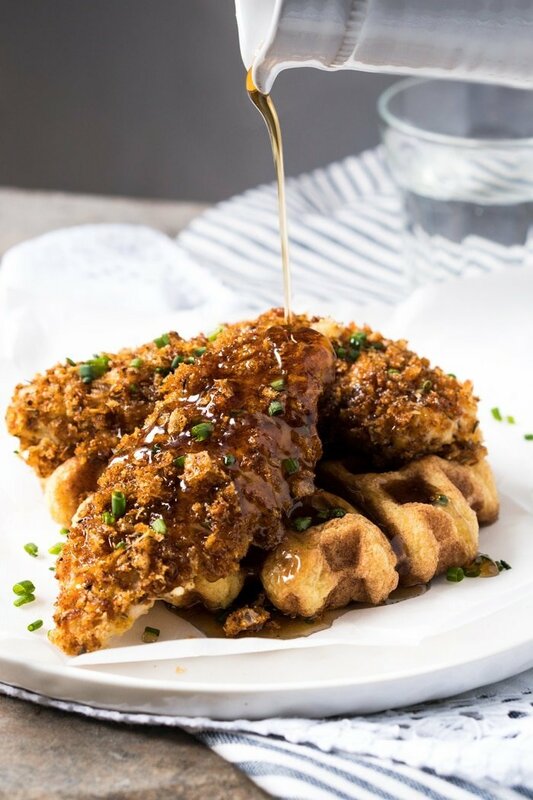 And while these are super awesome served up with our marinara sauce, you can also go a little bit naughty and do ‘fried’ chicken and waffles! Be sure to serve it up with maple or sugar free syrup (love Lakanto’s!) and our (1g net carb!!) light and airy keto waffles. A truly awesome marriage of flavors! Rinse and pat dry your chicken pieces. Set aside. In a large bowl suitable for marinating, mix together the sour cream, vinegar, poultry seasoning, garlic, freshly ground black pepper and season to taste. Add in the chicken, cover with cling film and marinate in the fridge for at least two hours (though preferably overnight!). Preheat oven to 425°F/220°C. Line a rimmed baking tray with aluminum foil and place a rack over it. Brush with olive oil or cooking oil of choice. You will need three bowls for the three coatings. In bowl 1, place your almond flour (or more crushed pork rinds). In bowl 2, whisk your egg with sour cream. And in bowl 3, mix thoroughly together the crushed pork rinds, Parmesan cheese, paprika, oregano, garlic powder, onion powder, freshly ground black pepper, cayenne and season to taste with salt (will vary quite a bit depending on the saltiness of your pork rinds). Dip your chicken pieces one at a time in the almond flour, followed by the egg, followed by the pork rinds mixture. Place in the prepared baking tray. Roast your chicken for 25-30 minutes until fully cooked (i.e. no longer pink and the juices run clear). Serve right away (though they're also surprisingly good cold too!). 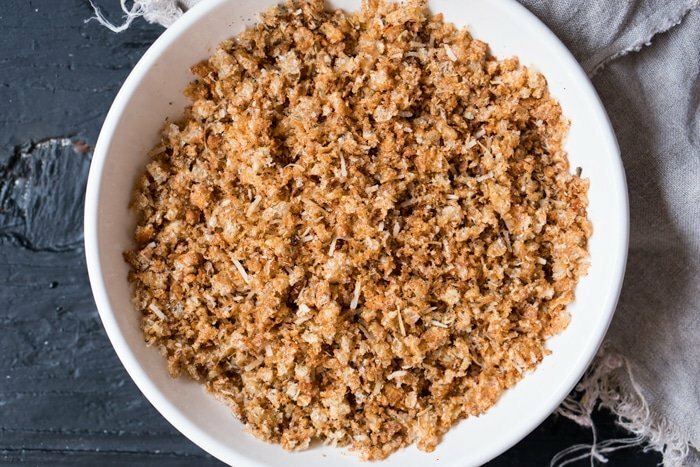 Keep in mind that you can decrease the carb count even further by substituting the almond flour with more pork rinds (or even some whey protein). Though taste and texture was optimal with the flour. Hi! Loved this just like I’ve loved everything else I’ve made from your recipes! You’re making this whole keto thing so much yummier! I had a hard time with the crust on the rack side sticking, so I ended up with a half-breaded chicken tender 🙂 I sprayed generously with olive oil first. Any ideas? If I have to buy from a grocery store, do you have a brand of pork rinds that you like? Pork rinds freak me out haha, so I have no clue of what kind to get. Thanks. These are ridiculously amazingly good!! Everyone in my family all of whom are non-keto loved them. I’m the only keto person and I am thrilled to be able to finally have a breading recipe that’s keto and crispy!! Better than the redults I used to get with a standard flour and bread crumb recipe. YAY! 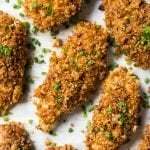 Hi can I use chicken thigh strips instead of chicken breast for a better keto fat protein ratio? Any adjustments needed in the recipe to keep crisp? I made these this evening and they are ridiculously good. These are the best chicken tenders I’ve ever tasted! 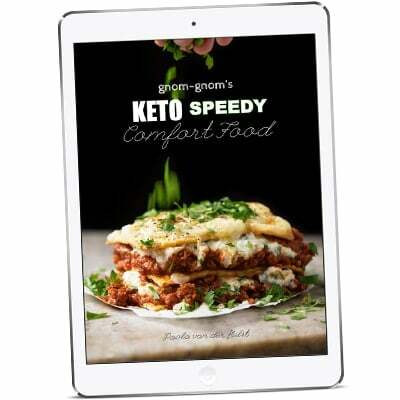 Excellent recipe – I’ll have to share it with my keto group! Do you think this would do well in an air fryer? TBH I can’t say for sure as I don’t have one yet xo! Lol that’s awesome to hear Ceci!! Another winner!! My guys ate every bit and wanted more….will have to triple next time. Thanks!! Hi there. Great site. I don’t eat pork. Is there any other possible substitute you can think of to get a crisp? Thanks! Hi Erin! Check out the fish tacos on the site, they’re lightly fried with whey protein- that’s also a great sub (albeit different) xo! I just made this for my non-keto family, and it was a huge hit. They are easy to make, and deliver a great crunch. Your instructions are clear, and the end result is a delicious dish I plan to put into regular rotation. The overnight marinade is definitely the way to go. Thank you for creating wonderful recipes that keep me inspired and having fun in the kitchen! 1 chicken tender = 1 serving? What kind of sour cream do you use? I find it easily in Baja California but I haven’t found it in Mexico City. You have to check out Flor de Alfalfa (also the butter! )- SO GOOD! They sell it in City Market or Green Corner. They’re getting they’re organic license, but overall they have good products (aside from they’re cheese, they’re tasteless) xo! What can you substitute the eggs and sour cream with? I want to try this recipe but I need dairy free. Hi Beva! In all honesty I haven’t found an equivalent dairy free marinade for these guys (I’m mostly DF too). Keep in mind that eggs aren’t dairy xo! And for us not allergy people you can omit the flour! I put the chicharrones in the food and processer and pulverize them! I then use the crushed ones as a coat. Been doing this for years! Chicharrones also come in spicy. No need to add spices. Throw in some sesame seeds! Definitely can sub the almond flour Martha (it’s also stated in the notes!). The one thing I don’t agree on is buying the spicy chicharrones- they generally have sugars and unwanted additives (plus, spice mixes are ALWAYS better homemade in my opinion!) xo! Can you taste the pork rinds in these? Not in my experience (you’re adding spices etc too). The flavor profile compliments the chicken beautifully xo!